Photograph of Berliners returning to their homes in Berlin, Germany . "(NY7-Aug.5) Berliners on way home -- These Germans pull a cart containing their belongings through a street in Berlin as they seek their homes in the war-torn capital. Photo by B.I. [San]ders, Associated Press staff photographer. (AP Wirephoto) ([...]11400) 45)" -- typed note on front. "Received. Examiner reference library. 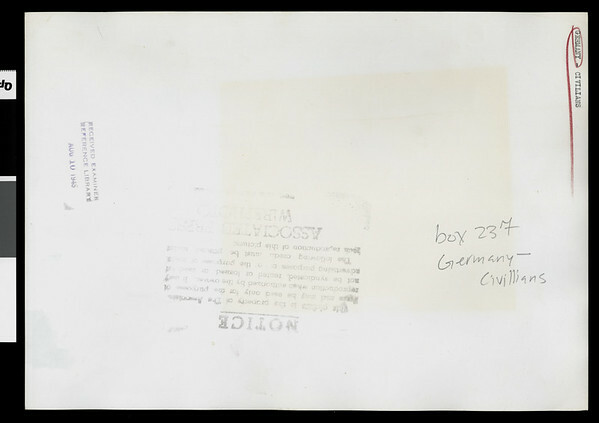 Aug 10 1945" -- stamped on verso.